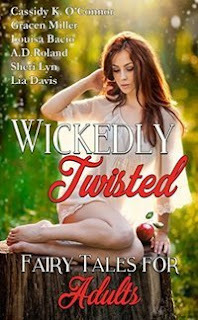 Today's featured book is Wickedly Twisted Anthology: Fairy Tales for Adults by Cassidy K. O’Connor, Gracen Miller, Louisa Bacio, A. D. Roland, Sheri Lyn, and Lia Davis. A dirty hobo who claims he’s wearing the Devil’s magic jacket befriends a slightly skeptical nurse. Can he convince her he's telling the truth in time for her to break the curse? The race is on. A jealous fairy has put a curse on Peter Pan, and it's up to Captain James Hook and his crew to follow the clues and save him before time runs out, or he'll be gone for good. If she can't have him, no one will. Can James and Peter have their Happily Ever After? Lia’s favorite things are spending time with family, traveling, reading, writing, chocolate, coffee, nature and hanging out with her kitties. She and her family live in Northeast Florida battling hurricanes and very humid summers, but it’s her home and she loves it! Sign up for her newsletter, become a member of her fan club, and follow her on Twitter. Welcome to the blog everyone!